I inherited good genes from my family (we’re all thin and tall). We were all abstemious in the war and didn’t eat a lot which I think is quite a good thing. We were very disciplined with food and even now I’m very careful. No food is ever wasted. I eat sensibly and I eat a lot, but little and often. Left overs are always used. I’ve always done exercise of some sort. At school I played lots of sport and rode horses. I got a lot of fresh air which is a good thing. I do yoga every day and have done for many years now. I do take care of myself. I go to bed at a reasonable time and sleep well. Having a positive attitude, which my mother had, is important. Just get on with it. We’ve only got one life and it’s good fun, so make the most of it. I have long admired Daphne from afar. 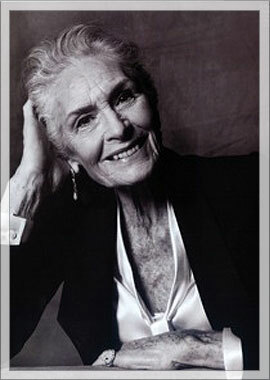 This extraordinary and beautiful woman who unbelievably in this ageist world, is working as a successful model at the age of 84! I was thrilled to get to meet her and delighted to find she was as down to earth and natural as I hoped she would be. She is full of energy and is truly an inspiration.